Subject access to Library and Archives Canada’s collection is made primarily through the use of Library of Congress Subject Headings (LCSH). A list of these headings has been actively maintained by the Library of Congress since 1898. But if the topic fits a Canadian like a warm winter toque, it is probably found in the Canadian Subject Headings (CSH) or its French equivalent in the Répertoire de vedettes-matière (RVM), published by the Bibliothèque de l’Université Laval. CSH and RVM are designed to be used in tandem with LCSH and follow the same principles for the structuring of the headings and most of the same policies as LCSH. The former National Library of Canada first developed a list of access points to Canadian topics not covered by the Library of Congress in 1968, to address Canadian terms and subjects from a Canadian point of view. 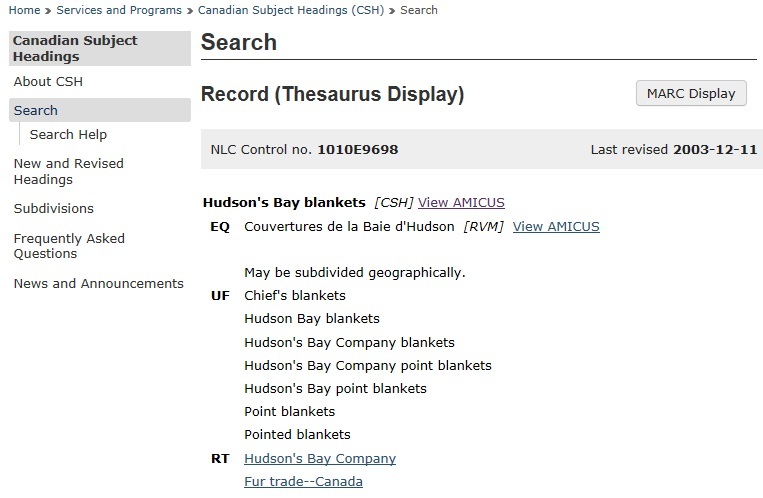 Canadian Subject Headings have been found on the Web since 2000 in conjunction with AMICUS, Library and Archives Canada’s database of bibliographic and authority records. The list is constantly updated to reflect subjects discussed from a Canadian perspective, including those recently in the news. The scope of Canadian Subject Headings is mostly limited to the Canadian cultural, economic, historical, literary, political and social experience. Subject areas include Canadian history, Canadian literature, Canadian government, Canadian geography, social and economic history, the Canadian legal system, Canada’s approach to second languages, bilingualism and multiculturalism, and Aboriginal or Native peoples. Example of a Canadian Subject Heading search result showing a uniquely Canadian subject heading. Do you have a suggestion for a new subject heading? We welcome your ideas! Send them to the Editor, Canadian Subject Headings at: standards@bac-lac.gc.ca. This entry was posted in Library and tagged Canadian Subject Headings, library, metadata, subject access by Library and Archives Canada Blog. Bookmark the permalink.